Tik Tok has been big for no more than 6 months, and its popularity has led it to take in ads. The app is what Musical.ly was. Many now know it from the funny videos of people doing lip sync. Last year, the app reached 500 million downloads, many believe the reason has something to do with China’s short video fever. Tik Tok, also known as Douyin, is a video social network owned by ByteDance, who in 2017 bought Musical.ly, the lip sync app. The app reached its peak in october 2018, at that momento they took down Facebook, Instagram and Snapchat as the most downloaded app. Giving a big suprise to the world of social networks. Although, the question remains if it’s gona be a one-month, one-year or a lifetime trend. Today, Tik Tok is still very much alive with 500 million monthly active users, they just behind Snapchat on video apps, so much that Snap has announced a mode to do lip sync on the app, very much like their competitor does. The first ad noticed on the Tik Tok platform was from GribHub, a food delivery company in the US. The ad comes like Instagram stories, it looks like user generated content but it’s actually a 5 second ad. So far it has been the only one in report. According to the report, the ad came on pre-launch of the app, in a very natural way for the social media, something very positive for the audience. Even though for many this could come as a suprise, it really is not. 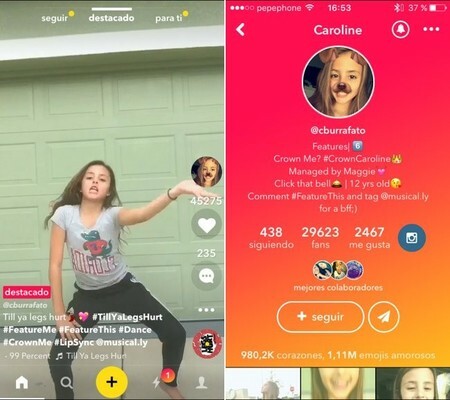 Before it was bought, Musical.ly was already testing varios ad formats and selling ad units. With a quick view of the app you can tell that the mayority of their userbase are teenagers, although it was found to be popular with older people, pólice officers, the military and Wal-Mart personnel. The site also brings a lot of attention on the high level of engagement between users. Because of the nature of the app, the range of the Gen Z and its focus on video, the social network shines with “challenges” like the #icebucketchallenge. Although we can also make use of the popularity of lip sync and carpool karaoke. The most important part of this app is that it’s very creative, the users give their best at the momento of making these videos, unlike Snapchat which has become a place for monologuing, partying and daily life. Tik Tok is a platform that’s open to creativity. Although, that’s how Instagram started, so the future might look quite different. Also, we must take a good look at the future competition in the form of Lasso by Facebook and the next boomerang video app by Vine co-founder Donn Hoffman, to be launched this year. The growing trend of video is more obvious every day and the importance of being creative too. Tik Tok is not just one more short video tool. Not many would dare to do something like this and even though it seems like a short temr trend like Vine, this one is much more interactive and engaging and that’s why there’s a bet for the long run. It’s a good time as any to get the creative juices flowing and think about content that can work for this kind of platform, that maybe it’s still the only one on the market, but this is only the beginning.